Mahindra 1626 HST Tractor, Loader, BACKHOE, Box Scraper, & Trailer! Mahindra 1626 Hydrostat Tractor with Loader, Backhoe, HD Box Scraper, & 18' Diamond C Trailer! This is the time to get set up with a quality tractor package! 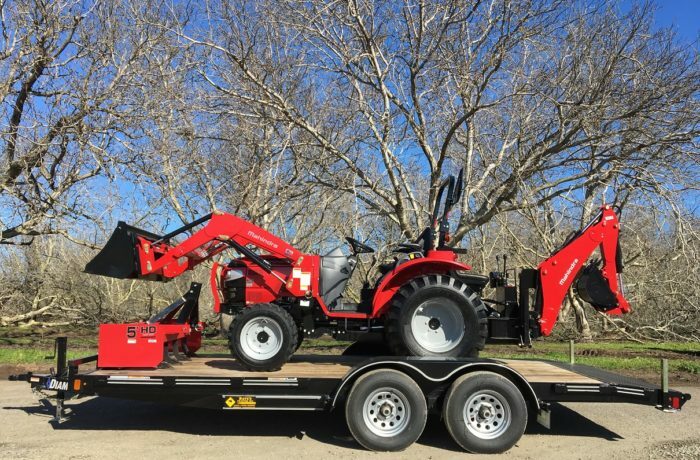 This package includes the strong and reliable Mahindra 1626 Hydrostat 4x4 tractor, loader, backhoe, box scraper, and a top-quality trailer to haul it all. That gives you everything you need to retire the shovel and wheelbarrow. Buying the equipment you need (or want) can’t get easier than this. On this package, absolutely nothing is compromise. The Mahindra 1626 tractor is a top quality that has proven extremely reliable for us over the years. The loader and backhoe attachments and implements are made in the USA, and are built tough. The trailer is a top-quality Diamond C trailer rated for 9,890 lbs! It’s not just some flimsy utility trailer. Check out the specs farther down in the ad and you’ll see that this package has no weak point. The discounts are really stacked up on our Mahindra tractors right now. The advertised price on this tractor includes a $3,200 cash/standard rate financing discount and right now select Mahindra implements qualify for the Power Package Discount, giving you $500 off 2 implements or $1,000 off 3 implements! That means that this package includes $500 off of the backhoe and box scraper. Add a third Mahindra implement and you can get another $500 off! Keep reading for some specs on this great package. - 7’ Backhoe Dig Depth! - 7 Year Powertrain Warranty! If this looks like a great tractor to you, but you want a different trailer, no problem! We have lots of flatbed trailer options to choose from, and we also have a HUGE selection of dump trailers! We can find the right trailer for you. Let us help set you up with the tractor and implements you need, and the trailer to haul it too! With so many discounts available today on a Mahindra, you don’t want to miss this opportunity. And don’t hesitate to call if you’re not sure what you need. We’re happy to take the time to share our knowledge and experience to help you get the right equipment the first time. Note: Prices do not include taxes and relevant fees associated with purchase. Mahindra 1626 Shuttle Tractor, Loader, 3 Implements, AND Trailer!